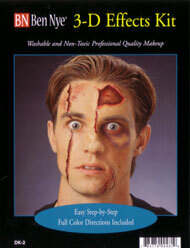 3-D Special Effects Makeup Kit. The ultimate for theatrical or masquerade easy-to-do character makeup designs. Each kit comes with a detailed step-by-step set of instructions and quality Ben Nye components. Kit includes: liquid latex, stage blood, spirit gum, spirit gum remover, injury wheel, nose and scar wax, stipple sponge, latex sponge, applicator brush, and pencil liner.